The potential tether application closest to Earth is for use in de-orbiting old satellites at the end of their useful lives, making them fall back into the atmosphere to burn up. That would lower the collision risk for operational spacecraft and prevent the generation of clouds of space debris frequently caused by inactive, deteriorating spacecraft. Cleaning up the space around Earth is a serious issue. At the moment there are about 10,000 satellites and rocket upper stages zooming around our planet, of which only 4 percent consists of active spacecraft. Objects with a low perigee altitude remain in orbit for years, but ultimately get sufficiently slowed down by the tiny aerodynamic drag to fall back to Earth and burn up in the atmosphere. However, satellites in orbits above about an altitude of 700 km (450 miles) generally stay there for hundreds or even thousands of years. 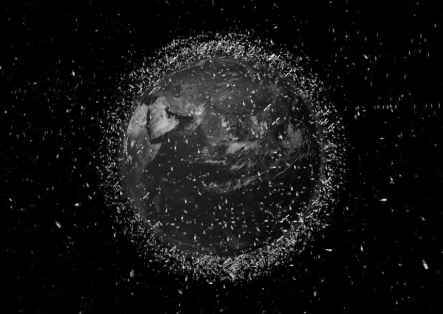 Because of the breakup of old equipment, collisions between objects, explosions caused by leftover propellant, and constant erosion by micro-meteoroids, the amount of debris orbiting Earth is currently over a million identifiable pieces. With precise radar measurements from the ground, some 70,000 objects the size of postage stamps have been detected in orbits between altitudes of 850 and 1000 km (530 and 620 miles) alone—all bits of frozen nuclear reactor coolant leaking from a number of old Soviet satellites. In addition, more than 200 objects were thrown out of the Mir space station during its first 10 years of operation, most of them rubbish bags. One spacecraft that created a huge amount of space debris was the upper stage of a Pegasus rocket launched in 1994, which blew up in 1996. The explosion generated a cloud of some 300,000 fragments bigger than 4 millimeters (0.16 inch) in diameter, in an instant doubling the space debris collision risk for the Hubble Space Telescope. In January 2007, the Chinese tested an anti-satellite (ASAT) weapon system by launching a missile against one of their own spacecraft. The rocket hit the old Fengyun-1C weather satellite and blew it into thousands of pieces. The U.S. military Space Surveillance Network identified more than 900 bits of debris over 10 centimeters (4 inches) in diameter. However, the total amount of debris resulting from the impact reaches into the tens of thousands of objects. NASA estimates that right after the test the number of debris fragments in orbit larger than 1 cm (0.4 inch) exceeded 35,000. "Any of these debris has the potential for seriously disrupting or terminating the mission of operational spacecraft in low Earth orbit (LEO). This satellite breakup represents the most prolific and serious fragmentation in the course of 50 years of space operations," said Nicholas Johnson, chief scientist for orbital debris at NASA's Johnson Space Center. The added trouble of space debris is that it does not stay in the orbit of its original source, but drifts into different orbits due to explosions, collisions, aerodynamic drag, and irregularities in Earth's gravity field. What starts out as a small cloud of pieces of an exploded satellite thus soon covers the entire globe in a thick layer, like the skin of an orange. The cloud of debris created by the Chinese anti-satellite missile, for example, extends from less than 200 km (125 miles) to more than 3850 km (2390 miles) in altitude, encompassing all of LEO (Fig. 5.1). A small piece of debris can create devastating impact energy because of the high orbital velocities involved: a tiny piece of 1 gram (0.04 ounce) moving in the opposite direction in LEO can hit a spacecraft as hard as a 1000-kg (2200-pound) car driving at 56 km/h (35 mph). In 1983, a tiny speck of space debris smashed into Space Shuttle Challenger's windshield and left a 4-mm (0.2-inch) crater. The debris was later identified as a chip of white paint, probably a remnant of a previous rocket launch. Between 1981 and 1996, shuttle windows sustained about 300 pits, and 55 panes were replaced, according to a 1997 National Research Council report. The first collision of an active satellite with cataloged (i.e., known and radar-tracked) space debris occurred in 1996, when a piece of an exploded Ariane rocket upper stage tore off part of the gravity stabilization boom on a small French satellite called Cerise. occasionally done by slowing them down using onboard rocket propulsion. However, that requires propellant, which makes the spacecraft or stage heavier to launch or reduces the mass that can be allocated to useful payload. If no extra propellant is taken onboard, the attitude control propellant that needs to be reserved for the de-orbit burn shortens the satellite's useful lifetime. This is why active de-orbiting is currently applied only for spacecraft in relatively low orbits, where a modest push of a rocket motor can lower a satellite's orbit sufficiently for it to dip into the higher levels of the atmosphere. The increased aerodynamic drag will then slow it down further, until the spacecraft plunges down and burns up. Satellites orbiting more than a couple of hundreds of kilometers high, way above the atmosphere, would require too much propellant to be de-orbited. Another problem with rocket propulsion de-orbiting is that it requires the satellite to be in good shape; if its attitude control system or onboard computer does not work well, the de-orbit burn may be executed in the wrong direction (resulting in a higher orbit and therefore increased time in space) or not happen at all. Tethers Unlimited, Inc. (TUI), the small U.S. company specializing in advanced space technologies, has invented a system that could be used to deorbit LEO satellites and rocket upper stages without rocket propulsion. Its Terminator Tether system is foreseen to be an independent package that is bolted onto a satellite. The only electrical interfaces with the satellite are those needed to monitor the health of the spacecraft it is connected to. As long as the satellite is operational, the device remains dormant, only waking up periodically to check the status of the spacecraft and listen for activation commands. When it is activated, either by a command from Earth or when it detects that its host has become defunct, it deploys a 5-km-long (3-mile-long) tether below the spacecraft. This tether is conductive, so that the ionospheric plasma and the geomagnetic field will induce currents running along the tether (as explained in the section Electrodynamic Tethers in Chapter 1). The resulting electrodynamic Lorentz force will slowly decelerate the spacecraft, lowering its orbit. Over a period of several weeks or months, the Terminator Tether could reduce the orbital altitude of the satellite or stage until aerodynamic drag and heating vaporize it in the upper atmosphere. The major advantage of this technique compared to other space propulsion systems is that, instead of propellant, it uses Earth's magnetic field as its reaction mass. The result is an overall smaller, lighter satellite that is less expensive to launch. Because the system also needs to work in case the satellite is completely dead, the Terminator Tether package has to be highly autonomous. Apart from the tether, a deployer, an electron emission device (to keep the current going), and control electronics, it also incorporates its own radio receiver and a small battery kept charged by a small solar array. After deployment the current running through the tether can also be used to power the electronics and deployer mechanism of the tether system, keeping the initially required battery and solar array small and light. Besides the full-scale Terminator Tether, TUI has also designed a greatly simplified, miniaturized system, the Nanoterminator, which could be used on very small satellites. A weakness of the concept is that while busy removing debris from space, the long Terminator Tether itself forms a collision risk for other spacecraft. Especially when arriving at lower orbits, the risk of the tether hitting an operational satellite may be higher than the original collision risk formed by the piece of debris it is trying to de-orbit. It may be better to discard the tether at low orbits, so that it is slowed down by the atmospheric drag more quickly (because its mass with respect to the drag force will be less than when attached to the defunct spacecraft). The actual piece of debris will then stay in orbit a bit longer, but the overall collision risk following this scheme is likely to be less than when keeping the tether attached until the end. The earlier mentioned proSEDS experimental mission was intended to be a precursor for an operational Terminator Tether system, but unfortunately this project was canceled shortly before its planned launch. In the aftermath of the loss of Columbia, it became a victim of the more stringent safety rules for experiments in orbits close to that of the International Space Station (ISS). An idea derived from the Terminator Tether concept is TUI's Remora Remover, which could be used to de-orbit spacecraft that are not equipped with a de-orbit system. This would involve an electrodynamic tether system onboard a small intercept vehicle. This small spacecraft could rendezvous with a spacecraft, then attach itself using a hooked net, harpoon, adhesive "sucker," or docking mechanism (hence the name Remora, which is a type of fish that attaches itself to larger fish and whales with a sucker-like organ). Once firmly connected, it would activate its onboard Terminator Tether system to remove the spacecraft from orbit. The Remora Remover could be used not only to de-orbit derelict satellites, but also to "kill" hostile or rogue spacecraft by bringing them down into the atmosphere. Tether Applications, Inc., which was also involved in the SEDS-1 and Plasma Motor Generator (PMG) in-orbit tether experiments, has studied a somewhat similar concept on a research grant from NASA's Institute for Advanced Concepts (which ceased to exist in August 2007). Tether Applications' Debris Shepherd involves an intercept spacecraft with a long electrodynamic tether to de-orbit space junk. However, in this case the intercept vehicle would be able to generate electrical power using solar arrays. As we have also seen in the section Electrodynamic Tethers in Chapter 1, when using this power to run a current through a tether, a propulsive electromagnetic force can be created. Depending on the direction of the current, the Lorentz force can be used to either accelerate or decelerate a spacecraft, "pushing" it into a higher orbit or "pulling" it into a lower orbit. Such an electrodynamic propulsion tether can thus actively fly toward a target object, capture it, and then lower its orbit. Once the space debris object is delivered into a sufficiently low, short-lifetime orbit, the Debris Shepherd could undock and return to a higher orbit using its electro-dynamic propulsion tether. The transported debris would relatively soon deorbit under the influence of the upper atmosphere aerodynamic drag, while the Debris Shepherd would be free to start hunting for other large chunks of orbital debris to bring down. The great benefit of the Debris Shepherd idea is that it is reusable. 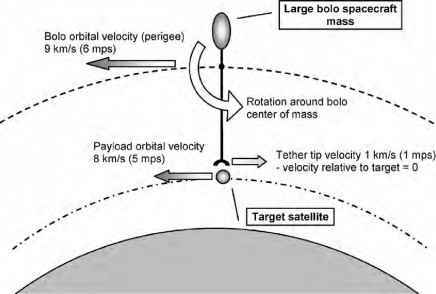 However, it needs its propulsive tether to be fully deployed during all its orbit changes, so control could be difficult (the NASA Institute for Advanced Concepts [NIAC] study proposed to use tethers about 10 km, or 6 miles, long). To avoid having to maneuver the long, flexible tether close to target objects and run the risk of entanglement or loss of control, Tether Applications thought of using detachable "Sheepdog" sub-spacecraft to inspect and capture the debris. Once having secured a good hold (bite) on the target, the Sheepdog would maneuver with its quarry and re-dock to the tether spacecraft. The difficulty with designing systems like the Remora Remover or the Debris Shepherd is that they must be able to capture all kinds of spacecraft and rocket stages with all kinds of different configurations. Especially in the case of rogue spacecraft, there will be many unknowns about the target's shape, size, appendages, and so on, and finding a smooth surface to stick to or a sufficiently strong solar array boom to grab onto is likely to be very challenging. Additionally, it will be very difficult to make a firm connection with old satellites that are tumbling due to propellant leaks or attitude control problems.